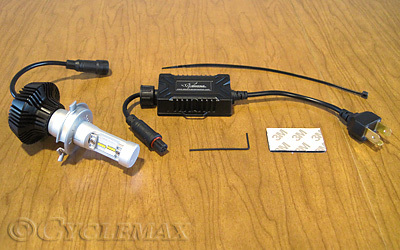 From the ground up, this is the most superior LED headlight bulb you can install. Thermal “Air Flux Cooling” naturally draws heat out and away from the housing. No fans. Phillips ZES LED’s that were designed exclusively for automotive LED headlight applications. Light point sources are identical to a standard H4 bulb for full reflector splay. Instant operation unlike HID. Unaffected by temperature or power cycling. Constant current power regulator in a separate housing makes the bulb no larger than stock. Zero noise induced into an audio system. Typically no trimming of the rubber boot required. One kit includes the following; bulb & power regulation unit. 360 degree light beam angle. 2.0amp (+/- .2) power draw. Stock halogen is 4.58amp. H4 connector for full plug and play operation.